Tumbled common opal from Virgin Valley Mines under short-wave ultraviolet light. These same stones are shown in the image below. Many specimens of opal display a fluorescence under short-wave ultraviolet light. Stewart Schneider shows several examples of fluorescent opal from Arizona, California, China and Australia in his books, Collecting Fluorescent Minerals and The World of Fluorescent Minerals. 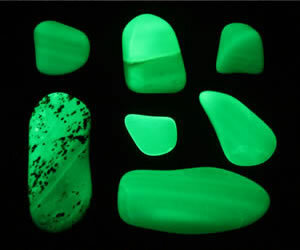 Most fluorescent opal exhibits a green color, but blue and white fluorescence is also encountered. Observing fluorescence in opal requires a shortwave ultraviolet lamp that emits light in the 100nm - 280nm wavelength range. The ultraviolet lamps (called "black lights") sold in novelty stores are usually not effective for observing fluorescence in opal because they emit light that has a much higher wavelength. Tumbled common opal from Virgin Valley Mines under normal light. These same stones are shown under short-wave UV light in the image above. We purchased a couple pounds of common opal from the Royal Peacock Mine, located in Virgin Valley, Nevada. They offered two types of common opal when we made our purchase: 1) moss opal; and, 2) fluorescent opal. The moss opal had a base color that ranged from creamy white to a rich honey brown with dark black mossy inclusions when viewed in normal light. 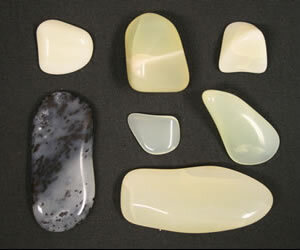 The fluorescent opal ranged from a translucent creamy white to a creamy yellow-green color in normal light. Many pieces had subtle color zones in normal light that became much more obvious in ultraviolet light. The opal that Royal Peacock advertised as "fluorescent opal" really lived up to its name. As you can see in the photos on the top right of this page it was a cream to pale yellow-green color in normal light but a very strong fluorescent green under short-wave ultraviolet light. Their mossy opal had a cream to honey color in normal light. Some of it had a weak green glow under a short wave ultraviolet lamp. A few of the cream-colored pieces showed a very strong green fluorescence. The specimens that we show in the photos are tumbled stones; however, the rough showed the same strong fluorescence. The Royal Peacock Mine website says that they are the world's only source of fluorescent opal. Perhaps it is the only place where you can easily purchase fluorescent opal; however, fluorescence in opal has been found at many localities. Common opal is commonly fluorescent. Precious opal is occasionally fluorescent too. We believe that very few people look at opal under ultraviolet lamps - that's why this property of opal is not widely known. Mossy opal and honey-colored opal (both common opals) from Virgin Valley Mines under normal light. These specimens show a very weak fluorescence under short-wave UV light. If you are interested in hunting opal in Nevada, there are three pay-to-dig sites: Bonanza Opal Mines, Rainbow Ridge and Royal Peacock. ** A note of caution. ** When you tumble opal you will lose a lot of weight and have no control over the shapes of the pieces. Also, opal tends to break up in the tumbler. Don't tumble expensive opal unless you have a lot of experience or a lot of money to burn. We only tumble common opal and maybe a piece of precious that has been preformed on the diamond wheel. We tumbled the Royal Peacock opal in medium grit in a rotary tumbler to develop some nice rounded shapes. We then ran the fine and polishing steps in a vibratory tumbler. Common opal is much softer (about Mohs 5.5) than the agate and jasper that we usually tumble (Mohs 7). So we were careful not to tumble it too long in medium grit. Our small pieces (up to about 1 1/2 inches) tumbled to rounded shapes in about ten days. Common opal can be very brittle and often suffers from crazing. Crazing is the development of tiny cracks that penetrate into the stone until they intersect. When you tumble crazed opal you usually end up with a lot of tiny pieces. If you enjoy tumbled stones, we have photos of a few other varieties that exhibit interesting fluorescence. Fluorite is the mineral that fluorescence is named after and we have a few photos of fluorescent fluorite. Moonstone often exhibits fluorescence and we show photos and explain why moonstone is not adularescent under UV light. 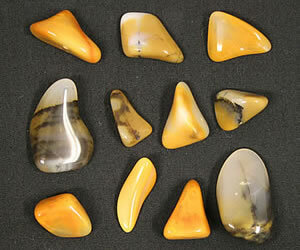 The most interesting tumbled stones with flourescence that we have seen are specimens of Ocean Jasper. The agate component of these specimens was clearly fluorescent and its intricate banding can be a work of art under the ultraviolet lamp. If you want to learn more about fluorescent minerals, we have an article on Geology.com (also a Geoshops.com website) that explains mineral fluorescence in great detail.